Seeing The Light - The Vega 250mm plastic lighthouse optic. 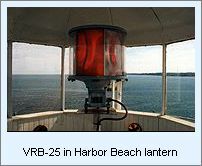 Manufactured by Vega Industries of Porirua New Zealand, has become a common lighthouse optic throughout the Great Lakes. Powerful and reliable, with a visible range of from 15 to 22 nautical miles, depending on the intensity of the bulb used, the unit features a lens carousel containing either six or eight replaceable acrylic panels, allowing for easy repair and field changes of characteristic. The carousel is rotated by a direct-drive brushless pancake motor, providing sufficient torque to rotate the assembly while consuming only 1 to 2 watts of power. The carousel rotates on a pair of fully sealed ball races packed with low temperature lubricant to help keep maintenance to a minimum. The assembly is equipped with a standard six-bulb automated lamp changer. Access to the bulbs can be made through a removable panel at the center of the upper cover, eliminating the need disassemble the carousel assembly when changing bulbs. A metal capsule with O-ring seals contains the microprocessor, which controls the lamp changer, solar switch and motor drive. With 255 rotating speeds from 0.5 to 15.9 revolutions per minute, the assembly can be programmed to display a virtually unlimited number of characteristics. An input voltage variance from 11 to 12 volts DA can be tolerated, as the lamp voltage is regulated to a constant 12 volts DC through onboard pulse width modulation circuitry.